Join Us!!! We are looking for someone to help us cover ASEAN League men basketball. Please send us an e-mail. Mono Vampire Bangkok (TBL) signed experienced 37-year old American power forward Christien Charles (216-102kg-81, college: Villanova). He played last season at Jobstreet.com Singapore Slingers in Singapore ASEAN League. In 15 games he had very impressive stats: 22.4ppg, 16.1rpg, 3.0apg, 1.2spg and 2.9bpg. Great season as he was named to Asia-Basket.com All-ASEAN League Honorable Mention. The list of the past achievements is quite long as among others Charles' team made it to the ASEAN League Semifinals in 2013, 2016 and 2017. He was also voted Asia-Basket.com All-ASEAN League Player of the Year and Asia-Basket.com All-ASEAN League 1st Team back in 2014. Charles is quite experienced player. He has played also professionally in Iran (Ararat), Lebanon, Philippines (Blackwater Elite), Saudi Arabia (Al Ahli Jeddah), Serbia, Syria (Al Jalaa and Al Jaish), Thailand (Thailand Slammers and Hitech), ABA (Chicago Steam) and Vietnam (Saigon Heat). Charles is close to retirement age as a player. It's very possible he may end his playing career at Mono Vampire. Charles attended Villanova University until 2006 and it will be his 13th (hopefully lucky) (!!!) season as a professional player. He could be described: Christien is a true 7 footer who has tremendously improved his game since he finished college due to an outstanding work ethic. As a reserve on the nationally ranked Villanova team, Christien had the opportunity to be trained by some of the best coaches in the country. He has developed into a very good player who plays with a lot of energy and heart. Very active big man that can run the floor extremely well. Fundamentally sound. Rebounds, passes well, scores and blocks shots. If left open, he can also knock down the 15 foot jump shot with consistency. Slender build. Must improve strength to reach full potential. Once rated as a top 5 center in the country behind such notable current NBA centers Tyson Chandler & Eddie Curry. Made Chicago Bulls summer league squad that featured Derrick Rose, Joakim Noah & Tyrus Thomas. Solid overseas resume that includes back to back championships with two different teams. Coachable, unselfish team player that has been groomed by the likes of Jay Wright & legendary big man coach Pete Newell. Christien would be a valuable asset to any team looking to add some size & skill. CLS Knights beat Saigon Heat to reach the semifinal stage. It was an exceptional evening for American-Nigerian power forward Maxie Esho (206-91, college: Massachusetts, agency: Two Points) who led the winners and scored 20 points and 9 rebounds. American guard Doug Herring-Jr (191-87, college: Utica) accounted for 18 points and 4 assists for the winning side. American center Kyle Barone (203-89, college: Idaho) came up with a double-double by scoring 23 points and 15 rebounds and American-Puerto Rican point guard TreVon Hughes (185-87, college: Wisconsin) added 22 points and 4 steals respectively for Saigon Heat in the defeat. Singapore Slingers held off Macau to advance into the next round. Singapore Slingers made 25-of-32 free shots (78.1 percent) during the game. 25 personal fouls committed by Macau helped opponents get some easy free throw opportunities. It was a great evening for American guard Xavier Alexander (198-88, college: S.Nazarene) who led his team to a victory scoring 24 points, 7 rebounds and 8 assists. His fellow American import power forward John Fields (205-88, college: Tennessee) helped adding 23 points and 14 rebounds. The best for the losing side was American guard Dewarick Spencer (192-82, college: Arkansas St.) with 28 points and 9 rebounds and American-Filipino guard Mikh McKinney (184-92, college: Sacramento St.) produced a double-double by scoring 18 points, 7 rebounds and 10 assists. Mono Vampire outgunned Formosa to advance into the semifinal stage. Mono Vampire looked well-organized offensively handing out 23 assists. Great defensive blocking was one of the keys in this match when Mono Vampire made 7 blocks. American forward Michael Singletary (198-88, college: Texas Tech) had a double-double by scoring 24 points, 10 rebounds and 4 assists to lead the charge for the winners and American-North Macedonian Romeo Travis (198-84, college: Akron) chipped in 10 points, 16 rebounds and 7 assists during the contest. Singletary is a former Eurobasket Summer League player, which is considered top international summer league in the market. American forward Tevin Glass (206-94, college: ETSU) responded with a double-double by scoring 23 points and 14 rebounds and his fellow American import guard Malcolm Miller (201-91, college: Southern) scored 16 points, 5 rebounds and 6 assists. Four Formosa D. players scored in double figures. Hong Kong ELL held off SM Beermen to sweep the series. Strangely SM Beermen outrebounded Hong Kong ELL 49-29 including a 19-8 advantage in offensive rebounds. They looked well-organized offensively handing out 21 assists. The best player for the winners was American-Dominican guard ODarien Bassett (189-86, college: Troy) who had a double-double by scoring 28 points, 5 rebounds and 15 assists. 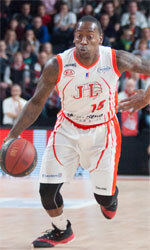 American guard Marcus Elliott (191-84, college: Louisiana Tech) chipped in 29 points, 8 rebounds and 4 assists. Five Hong Kong ELL players scored in double figures. Hong Kong ELL's coach used a ten-player rotation which allowed the starters a little rest for the next games. American-Puerto Rican center Peter Ramos (222-85) produced a double-double by scoring 21 points, 13 rebounds and 5 assists and American-Puerto Rican forward Renaldo Balkman (203-84, college: S.Carolina) added 16 points, 11 rebounds and 6 assists respectively for the guests. 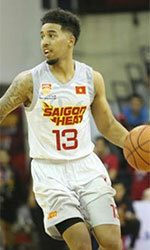 Saigon Heat outscored CLS Knights to even the series at 1-1. Saigon Heat made 21-of-26 free shots (80.8 percent) during the game. The best player for the winners was American-Puerto Rican point guard TreVon Hughes (185-87, college: Wisconsin) who scored 30 points, 7 rebounds, 4 assists and 4 steals. American center Kyle Barone (203-89, college: Idaho) chipped in 23 points and 9 rebounds. American center Darryl Watkins (211-84, college: Syracuse) produced a double-double by scoring 20 points and 13 rebounds and American-Nigerian power forward Maxie Esho (206-91, college: Massachusetts, agency: Two Points) added 21 points and 11 rebounds respectively for the guests. Four Saigon Heat and five CLS Knights players scored in double figures. Macau nipped Singapore Slingers to force the decider. Strangely Singapore Slingers outrebounded Macau 46-34 including 31 on the defensive glass. American-Filipino guard Mikh McKinney (184-92, college: Sacramento St.) notched a double-double by scoring 25 points, 5 rebounds and 13 assists to lead the effort and American power forward Ryan Watkins (206-91, college: Boise St., agency: Two Points) supported him with 20 points and 14 rebounds. Even a double-double of 27 points, 12 rebounds and 8 assists by American guard Xavier Alexander (198-88, college: S.Nazarene) did not help to save the game for Singapore Slingers. His fellow American import guard Jerran Young (198-91, college: Wright St.) added 19 points and 12 rebounds for the guests. INTERVIEW WITH CHRIS GARNETT BRUNEI's PLAYER OF THE WEEK for WEEK 15!